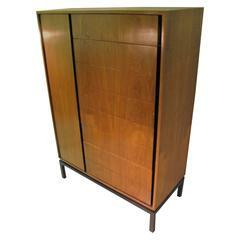 Fabulous 6 drawer dresser by Merton Gershun. 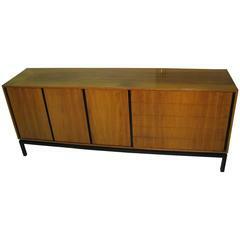 Louvered drawer fronts and brass fronted stretcher his signature Dania pieces. Solid walnut construction, a well crafted piece. 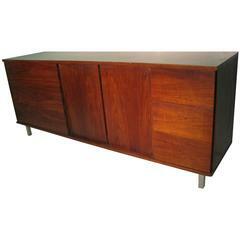 Simple and elegant clean lines created from bleached rosewood with an ebonized base. Seven drawers along side a tall door that have several pull out trays for personal items.